Lime Green Solid Boutique Bow with Pink, Lime Green and Purple Dots on top. 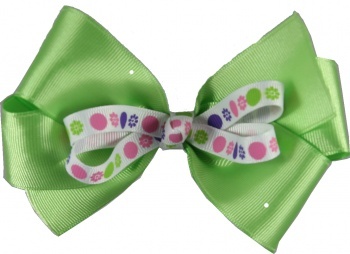 This is a shiny lime green grosgrain bow is 1.5 inches wide. Then it is topped with a white grosgrain ribbon that has big polka dots in a row alternating pink, lime, and purple colors. This bow is wrapped in the center with the same 3/8 inch polka dot ribbon in a French knot and is attached to a French clip.